Typically 3-way air valves are used to control the air muscle see figure 13. To activate the air muscle, valve labeled #2 is opened. This causes the air muscle to contract. Once activated the #2 valve may be closed without impacting on the state of the air muscle. The air muscle stays in a contracted state. To relax the air muscle, the air pressure must be vented by opening valve labeled #1. A three-way stopcock air valve may be purchased, see figure 14. The stopcock air valve allows you to control the air muscle manually. 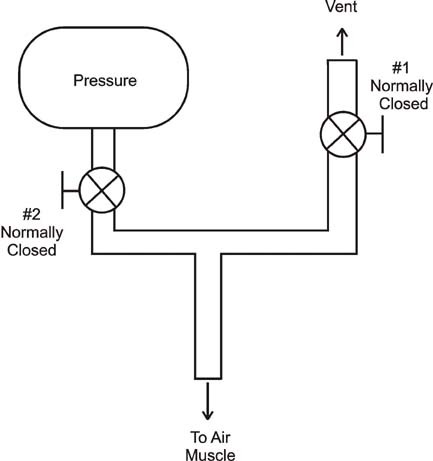 A three-way valve may be simulated or constructed using two one-way air valves. Small plastic aquarium valves purchased at a local pet shop have work quite well. However they are not rated for work at 50 psi and that's a good reason to wear eye protection, just in case they pop apart from the air pressure. Using manual valves are fine for testing air muscles, to build a robot or industrial device we must provide a way for electronic control. Fortunately this is not difficult. There are a number of solenoid air valves available. I prefer the Isonic valves from Mead Fluid Dynamics. 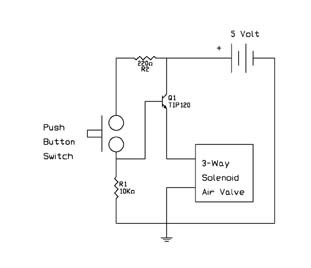 These are 3-way air valves that are activated using 5 Volts see Figure 14. The 3-way Isonic values automatically vent the air muscle (through the back) when it is deactivated. To see how this particular valve works look back to figure 13, in the Isonic valve, the valve labeled #1 is normally open, this is the vent, through the back of the valve. The valve #2 is normally closed, this is labeled "In" on figure 14. The air stream to the air muscle is labeled "Out" in figure 14. When the electronic valve is activated valve # 2 opens allowing air pressure to the air muscle and valve #1 closes. When deactivated each valve changes state; valve #1 opens, venting the air muscles air pressure and valve #2 closes separating the air supply from the air muscle. 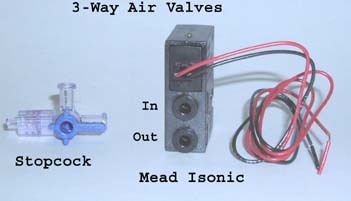 The front of the Isonic air valve has two quick connects-disconnects for air tubing. This particular air valve connects handles semi-ridge 4mm tubing, which is a good size for running air to the air muscle. To use the quick connect simply push the air tubing into the hole, it will lock in. To disconnect, hold the valve flange to the valve body with your fingers and pull the tubing out. Mulitple Isonic air valves may also be mounted onto a common manifold that make making multiple air muscle control that much easier. Figure 15 is a simple manual control schematic for a 5-volt control circuit for the Isonic valve.